Advantech UPOS-211 15" Compact and Stylish All-in-One POS System - UPOS-211 is an all-in-one point-of-sale (POS) system that features a small footprint and dual-hinge design, making it ideal for countertops and limited-space installations. Powered by an Intel® Celeron® J1900/Core™ i processor, UPOS-211 ensures high-performance computing and reliable data processing, while supporting flexible customization for diverse applications. 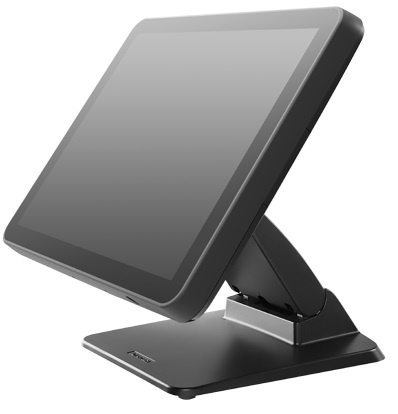 POS-211 is an All-in-One POS System with 15" true-flat PCAP touch or 5 wire Resistive touch. It is with Intel Baytrail or Skylake-U processor, fanless design with quiet operation and energy saving. It features dual hinge design which provides the smallest footprint to save counter space and reduce shipment freight. It provides easy access to key components. 15" Modularized Fanless POS System -- UPOS-520 15.1" TFT display in LED backlight Flat and borderless front PCAP touch panel design Reserved display hatches for peripheral requirement Fanless design for quiet operation Clean cable and screwless back. All-in-one efficient POS Box Solution -- UPOS-540 Equipped with Intel® Celeron® J1900/Core™ i processor delivers reliable computing performance Aluminum housing increases ruggedness and heat dissipation Compact design ensures flexible installation Support flexible I/O facilitate expanded applications Support. 5" Multi-functional Handheld POS System -- AIM-33 Industrial-grade mobile POS with built-in Cortex Quad Core, 1.3GHz Stylish and slim design provide ideal hand-held operation Modular configuration design for diversified applications Built-in MSR, IC, NFC Reader and 13M. Advantech UPOS-211 15" Compact and Stylish All-in-One POS System - J1900 4/64GB, SSD, 15", PCAP, No O/S - UPOS-211 all-in-one, 15" PCAP, J1900 2GHZ processor (fanless), 4GB RAM, 64GB SSD, No operating system, 3xUSB, 2xCOM, desktop, black.